Around 240,000 car occupants were killed in road collisions in the EU in the years 2001-2012. There were 12,345 deaths in 2012 compared with 27,700 in 2001 (1), a cut of 55%. Deaths of car occupants were cut by more than the overall death rate (49%) and substantially more than the rate for other road users (41%). Car occupants have therefore benefitted more than other road users from road safety measures adopted over the past decade. This is not surprising, as many of those measures were targeted at car occupants including increased enforcement of the main traffic offences, improved vehicle occupant protection, and, to a lesser extent, improved infrastructure. But car occupant deaths still represented almost half (48%) of all road deaths in 2010-2012 (Fig. 4). So achieving the EU road safety target, to reduce road deaths by half by 2020, will therefore continue to depend strongly on the EU and its Member States sustaining reductions in car occupant deaths. 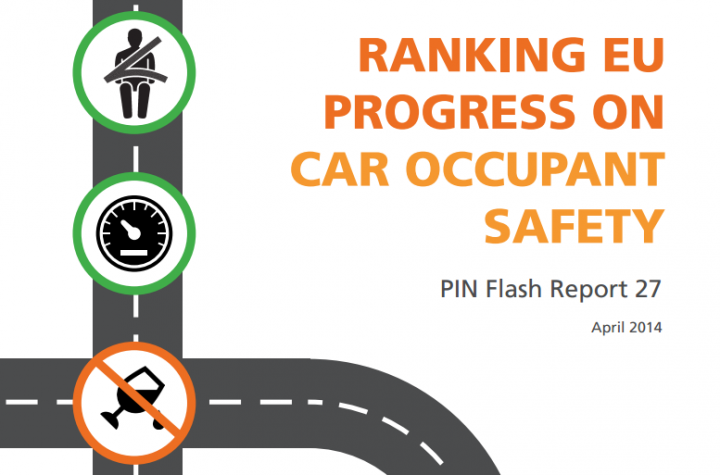 The number of car occupant deaths has decreased in all PIN countries since 2001. Spain and Latvia achieved the best annual average reductions between 2001 and 2012 (Fig. 1). Good progress was also made in Switzerland, the Netherlands, the UK and Sweden which are now the safest countries in terms of car occupant deaths per billion vehicle-km travelled (Fig. 3). Male drivers represented 56% of people killed in cars in 2010-2012, male passengers 17%, female passengers 14% and female drivers 13% (Fig. 6). Out of the 7560 males killed in cars, 77% were driving and 23% were passengers, while out of the 2900 females killed in cars, 49% were driving and 51% were passengers. About half of the males killed were aged between 15 and 35 (Fig. 7). In most countries, the percentages of car occupants wearing seat belts were markedly higher in 2012 than in 2005 (Figs. 8 and 9). ETSC estimates that 8600 deaths in cars were prevented in 2012 across the EU by the wearing of belts. Another 900 would have been prevented if 99% of those in cars in collisions had been wearing them. An average reduction in traffic speeds of 1km/h could have prevented another 1300 deaths in 2012, and the elimination of drink driving another 5600, many of them car occupants. Car occupant deaths are also being reduced by increases in the proportion of cars that have 5-star Euro NCAP ratings and Electronic Stability Control. Children aged 0 to 14 killed in cars across the EU numbered 4 per million child population each year in 2010-2012 (Fig. 12). This rate ranged across most of the PIN countries from less than 1 to more than 8. Correct fitting and use of child restraints is important in preventing such deaths. Adopt strong legislation and apply best practices in enforcement in particular against speeding, drink driving and the non-use of seat belts and child restraints. Promote the introduction of owner liability as opposed to driver liability to facilitate enforcement of speed limits. Develop the use of alcohol interlocks in rehabilitation programmes for first-time high level offenders and for recidivists. Improve learning and qualification systems for novice drivers. Implement the Infrastructure Safety Directive on all major roads. Align type approval crash tests with high performing Euro NCAP crash tests. Extend mandating fitment as standard equipment of an enhanced seat belt reminder system for all vehicle seats with audible and visual warnings. As a first step towards wider use of alcohol interlocks, require their use by professional drivers. Support the swift introduction of Intelligent Speed Assistance (ISA). Extend the instruments of the Infrastructure Safety Directive to cover all motorways, rural and urban roads within the ongoing revision of the Directive. (1) EU28 except BU, HR, LT, SK. See indicator box in the main report. Read the press release and press coverage for this report.